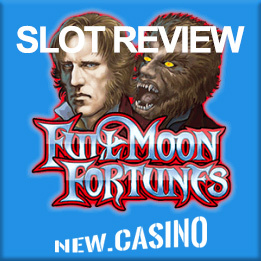 The werewolf craze is one reason why the Full Moon Fortunes online slot machine game has been a success. Based on the typical werewolf fable, it prepares players for the game by launching it with an introductory video that sets the mood. When the main game screen is loaded, players will notice that the reels are covered in red blood. They will also hear some sound effects that will make their skin crawl. The symbols seen on the reels are also meant to help set the mood of the game. They include a tombstone, which serves as the scatter symbol. Players will also notice that the reels include a silver bullet, footprints, a Family Crest and Dr. Blackwood. Not surprisingly, the wild symbol is represented by a werewolf. Going by the name of the game, the full moon adds an extra element to it. When a full moon is active, any Dr. Blackwood symbol on the reels becomes a werewolf, thereby adding wild symbols to the reels and increasing a player’s chances of winning money. Along with the transformed symbols, multipliers are added to increase the amount of money players win. Another symbol that players should be aware of in this game is the dragon jewel stacked symbol. One reason why players love this game so much, is that free spins are granted more often than in other slot machine games. All players have to do to get free spins is to get three of the tombstone symbol on the reels at once. When this happens, a new game screen is loaded and players will see a graveyard full of tombstones. They can click on those tombstones and get a multiplier as a result. Players then get either one free spin or three free spins, which come with a multiplier that doubles or triples the amount of money won. The value of the multiplier a player gets are determined by how many scatter symbols triggered the bonus in the first place. The number of free spins they get is determined by the tombstone a player clicks on. While this bonus is being played, the wild symbol is temporarily represented by Dr. Blackwood. The luckiest players will get a multiplier that gives them 25 times more in winnings. Boasting 3D graphics, Full Moon Fortunes may not be in every online casino, but the ones it is in have made it popular with players. Anyone who can’t get enough of werewolves will be able to appreciate this game. It is scary enough to provide an adrenaline rush without being so scary that it turns players off. With the bonus rounds paying out frequently, players will find that this can be a profitable game. By placing significant bets, players are adding to the excitement that the game brings them. The possibility of huge cash prizes has already drawn many players to this game. It will likely continue to grow in popularity as more and more players discover how fun it is.